On the 22nd of January in 1823 Ferenc Kölcsey – one of the most important literary characters in Hungarian history – completed his manuscript of the Hungarian National Anthem. It became the Day of Hungarian Culture in 1989. 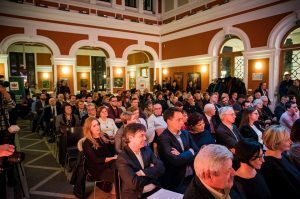 Seven years ago the Democratic Alliance of Hungarians in Romania (RMDSZ) set up the Prize for Contemporary Transylvanian Hungarian Arts to be awarded on the Day of Hungarian Culture, the 22nd of January. The Alliance annually awards three Hungarian artists living in Transylvania, who through their works of art and their actions in the field of culture have spectacularly contributed to the enrichment and familiarization of Transylvanian Hungarian culture. This year RMDSZ President Hunor Kelemen awarded four outstanding artists: in the category of fine arts painter Róbert Pál Köteles, in the field of performing arts actor and director András Hatházi and in the category of literature novelist Balázs Zágoni who has really surprised the Transylvanian Hungarian audience with his new book, The Sphere published last year. This year a fourth category was launched, that of literary translation. Marius Tabacu, the translator of Transylvanian Trilogy written by Miklós Bánffy, through his works establishes a bridge between Hungarian and Romanian culture in Transylvania, the laudations highlighted. “We want to show, that the Transylvanian, Hungarian culture is not something we cherish just because of our past. We have created in the last one thousand years incredible works of art, but through the fact that these people are creating here, at home in Hungarian on a daily basis, that means that our culture is still alive, that there is a need, there is a wish for these people to create for the Transylvanian-Hungarian audience. That also means that this community, able to produce new art on a daily basis is actually a very strong, very live community, that will last here for the next one thousand years also”, said RMDSZ vice-president Csilla Hegedüs. “This is about acknowledgement. It is about honoring our artists. Because culture cannot be the part of a festive day only, there has to be Hungarian culture in the everyday too. The feast is a good occasion to stop for a second and to turn our attention to our artists and say thanks to them for enriching our lives through their works“, Kelemen said.